All credit goes to the author, jk. "Making a USB bootable operating system is a good idea if you want to install an operating system in machines that has no optical drive, for example netbooks and ultra-portable laptops. Moreover, one of the main advantages of a bootable USB disk is, as it is faster than the optical drive, installing your OS requires less time, but, of course, your motherboard should have USB boot support. Here is a very simple solution to create a bootable USB drive for Windows 7 without any extra expense and DOS technique. 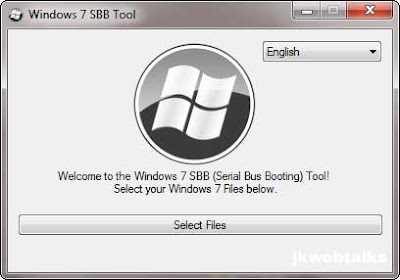 The free application called Windows 7 SBB Tool lets you easily create USB bootable windows 7 setup in few steps. It is very simple to use if you have Windows 7 iso file, just extract the files in any location of your local disk and specify it to SSB Tool. You can choose any removable device (USB drive, SD Card, etc), if your motherboard has support for that.